Home » Uncategorized » Time to Raise Money for a Good Cause! In the Spring of 2014, The Bourbon Mafia had the pleasure of participating in an exclusive event with the great folks of Maker’s Mark. As part of the experience, each of the 14 active members in attendance were given a special VIP Maker’s Mark bottle to remember the day. 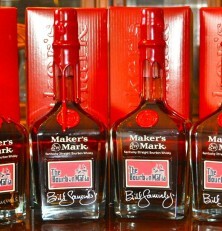 As a bonus, Maker’s Mark provided 6 additional bottles for The Bourbon Mafia to use for charitable collections. All 20 of the bottles were numbered 1 of 20 so everyone can have #1. Over the next few months, The Bourbon Mafia will be conducting auctions, raffles, or other fund raising activities with these 6 remaining bottles to raise money for good causes in Kentucky and around the country. We are going to kick this off with a raffle for one of the bottles to benefit the Pancreatic Cancer Action Network (www.pancan.org). This organization has distributed more than $23 million in funds to researchers, diligently working towards a cure to this horrible disease. For this raffle, we will be selling 40 tickets at $25 each. Every penny of the $1000 raised will be donated to the Pancreatic Cancer Action Network! If you are interested in a chance to support this worthy charity and win a pretty cool Maker’s Mark bottle (there may be some Bourbon Mafia swag included too! ), please contact Brain Gelfo of The Bourbon Mafia through Facebook or via email at brain@thebourbonmafia.com. If all 40 tickets are sold before September 17th, The winner will be chosen by either Bill or Rob Samuels at the Delectable Distillery event at the Maker’s Mark Distillery on Thursday, September 18th. Thank you for your time and consideration in supporting such a worthy cause!